A few weeks back, the monkies and I came across Alexandra Canal Linear Park while we were in the vicinity of Queenstown. Now I don't know about you, but I have never heard about this park. Ever. So it came as an extreme surprise when we stumbled upon this. A Rope Playground! Which obviously drove the boys nuts. The Rope Playground consists of long adventurous rope bridges and tunnels which will make for endless climbing and scampering fun for kids. And because the ropes are sturdy enough to support adults - I know because I tried - parents can join in the fun too! Initially, I thought that was as good as the Alexandra Canal Linear Park got and we duly returned home satisfied. So imagine my amazement when I found out after a little research online that the entire stretch of the park housed FIVE playgrounds! Yes, 5 playgrounds along this unique park which is it is built on top of a covered canal. It starts from Queenstown MRT Station, passing by Strathmore Estate all the way to Tanglin Road. And if that sounds like an awfully long distance to bring your kids, it actually isn't - it is only a 1.4km stretch, which is easily doable for a nice stroll. And as soon as I told the boys about this hidden gem of a find, there was only one thing left to do. We just had to see them for ourselves! We began our playground-hunting at the end of Alexandra Canal Linear Park closest to Tanglin Road with Masjid Jamae Queenstown on our right... but that did not exactly turn out to be the best of starts. Okay, so the playground was undergoing a total overhaul but according to the signage, it will be ready come mid-January 2014. Undaunted, the monkies and I pressed on. We fared better luck at the next checkpoint at the foot of Block 61C where we came across some interesting play structures that we don't usually see at other playgrounds. For starters, there was the gondola ride where I had to turn the axle in order to ferry the monkies across. Fun for them, but a very tiring workout for my poor arms if you ask me! Thankfully for my aching arms though, the special trampoline beside the gondola caught the monkies' attention almost immediately. No invitation needed, I surmise. But the most interesting bit of the playground are the eye-catching squiggly blue and red ‘Telephone Tubes’ where kids can communicate through them. And communicate the monkies did. Just a few steps away and further inside, lies a so-called 'Bug' Playground... thanks to its ladybug motif on the ground of the playground. This is pretty much a normal playground, with a slide structure and a four-roped swing. But normal or not, you can always count on the monkies to have a great time! En-route to the fourth playground of our hunt, we came across the Dawson Water Terrace. The Dawson Water Terrace comprises of a set of Water Steps and a Reflective Pool which serves as a reminder that a canal lies underground. The water comes from the Alexandra Canal below and is treated to make it clean for recreational use. The next playground found at the bottom of Block 81 is your typical playground with its rock-shaped climbing wall and slides. The most interesting part of the playground lies hidden below this orange climbing 'rock'. See if you can crack the code underneath it. And once the monkies solved the puzzle, there is always the good old-fashioned hopscotch to keep them occupied for a few minutes. The 1.4km trek then culminates with the Rope Playground, which is located a short distance away from Block 83. Which the boys were only to happy to go through it once again. Beyond that 5th playground is a Skate Park, which will mark the end of the Alexandra Canal Linear Park. Buses: Bus services 51, 111, 145, 186 or 970 and alight at Queenstown MRT Station. 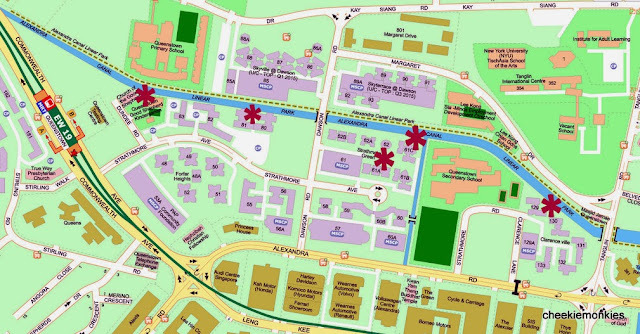 Walk along Strathmore Avenue from Queenstown MRT Station and locate Block 83. Very cool! Thanks for the great find! Is the stretch well shaded? Worried it might get too hot towards the later part of the morning..
Certain parts of the park are pretty well-covered by trees. We were there from 10-11am so it didn't feel that hot. Oh dear, are the play areas undergoing refurbishment? Or is it a total removal of the playgrounds?